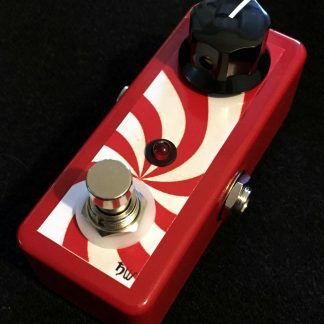 Want smooth tube clean boost or overdrive in a pedal? How about using a tube? A few years ago someone asked me to build a Valvecaster-type tube overdrive pedal. Powered by an 12au7 vacuum tube, the Valvecaster produces a huge volume boost, but adds only a bit of tube overdrive. So after playing with the design I came up with the Dark Matter. 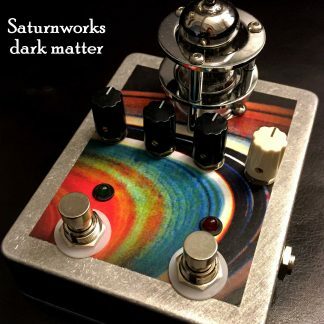 The Saturnworks Dark Matter has higher gain and warmer tube grit than the original Valvecaster. Among other tweaks, the Dark Matter adds an extra internal preamp circuit, activated with a footswitch and controlled with an overdrive knob. The boost circuit pushes the tube much farther than the standard Valvecaster design. The pedal also features master volume, tone, and gain controls. Click here and here to hear the Dark Matter in action. The Dark Matter Jr features the same overall components as the full-sized Dark Matter, but in a space-saving footprint. The Jr. skips the second footswitch for the solid-state booster/tube driver. It still has the circuit–just as preamp boost knob, rather than a separate switch. It also skips the separate tube gain control, with the solid-state preamp working to overdrive the tube. A Die cast aluminum enclosure. High quality footswitches for smooth operation and longer life. The Dark Matter pedal runs on standard 2.1mm 9v DC center-negative power. At around 350mA, it is a power hog, though, so it is a good idea to run it on its own power supply, or an isolated power supply. If you need a power supply, we have one here. Dark Matter, Dark Matter Jr. This pedal sounds amazing with both guitar and lapsteel. It’s got a sweet n’dirty tone that you can dial in many ways .. and it always cleans up nicely with a turn of the guitar’s volume knob. If I dial it in just right, I can get three or so tones on the way down. Volume 10 is snarling, 8 is creamy blues, and 5 is sparkly clean but still very present. As far as steel goes .. it’s just the cherry on top of any rig. My ol’ National New Yorker through a 72′ Fender Twin, goes from sounding like it’s saying aloha into grinding vintage blues with this beauty juicing the line. From Maui to Kansas City with the stomp of a foot. I finally got the chance to play around with my new Darkmatter overdrive and holy cow, man! This is absolutely hands down the best OD pedal I’ve ever used. It makes my Morgan AC20 sing. Not only is the tube side amazing but the boost circuit is better on its own than my ep booster. You should be charging double for these! Anyway, thanks for making such a fantastic product. I’ve bought and sold dozens of ODs over the years but this one isn’t going anywhere. This pedal is awesome! It’s like sweet n crunchy candy. Yes – you can get some screaming distortion going. The combination overdrive and preamp made it easy to locate several sweet spots where I can use my guitars volume to go from lean to downright nasty.